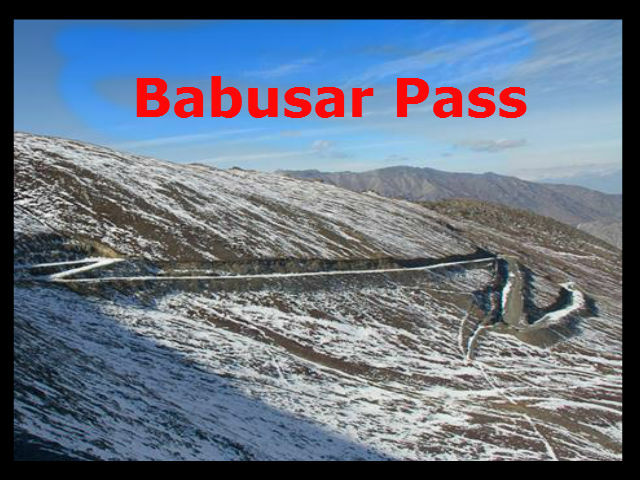 Babusar Pass or Babusar Top (4173 m./13,691 ft.) is a mountain pass at the north of the 150 km. (93 miles) long Kaghan Valley connecting it via the Thak Nala with Chilas on the Karakoram Highway (KKH). The mountain ranges which enter Mansehra district from Kashmir are the offshoots of the great Himalayan system. In Kaghan valley the mountain system is the highest of the area including the Babusar top. This range flanks the right bank of the Kunhar, contains a peak (Malika-e-Parbat) of over 17,000 feet (19), the highest in the district. On the mountains the grasslands are also found where Gujars and other nomads migrate during summer for grazing their sheep, goats and other animals. On the northern side there are mountains which are the extension of the same mountain system as that of Kaghan mountains. This range diverges from the eastern side at Musa-ka-Musalla a peak (13,378 feet) (20), which skirt the northern end of the Bhogarmang and Konsh valleys, and sends down a spur to divide the two. Here thick forests are found especially on the higher slopes. It is the highest point in the Kaghan Valley.The Kaghan area can be access by road via the towns of Balakot, Abbottabad and Mansehra . The Kaghan Valley is at its best during summer. Best time to visit is from May to September. From the middle of July up to the end of September the road beyond Naran is open right up to Babusar Pass. but it is restricted during the monsoon and winter seasons. The Badawi Pass is a pass that connects Upper Dir District with Kohistan District in Khyber Pakhtunkhwa, Pakistan. Bilafond La means "Pass of the Butterflies" in Balti language. It is also known as the Saltoro Pass. It is a mountain pass situated on Saltoro Ridge, located immediately west of the vast Siachen Glacier, some 40 km (25 mi) directly north of map point NJ 980420 which defined the end of the 1972 Line of Control between Pakistan and India as part of the Simla Agreement. The Bolān Pass is a mountain pass through the Toba Kakar Range of Balochistan province in western Pakistan, 120 kilometres from the Afghanistan border.The Bolān Pass is an important pass on the Baluch frontier, connecting Jacobabad and Sibi with Quetta. Strategically located, traders, invaders, and nomadic tribes have also used it as a gateway to and from South Asia. The Bolān Pass has always occupied an important place in the history of British campaigns in Afghanistan. From Sibi the line runs south-west, skirting the hills to Rindli, and originally followed the course of the Bolān stream to its head on the plateau. The destructive action of floods, however, led to the abandonment of this alignment, and the railway now follows the Mashkaf valley (which debouches into the plains close to Sibi), and is carried from near the head of the Mashkaf to a junction with the Bolān at Machh. An alternative route from Sibi to Quetta was found in the Harnai valley to the N.E. of Sibi, the line starting in exactly the opposite direction to that of the Bolān and entering the hills at Nari. The Harnai route, although longer, is the one adopted for all ordinary traffic, the Bolān loop being reserved for emergencies. At the Khundilani gorge of the Bolān route conglomerate cliffs, which rise to a height of 800 ft., enclose the valley. At Siri Bolān the passage between the limestone rocks hardly admits of three persons riding abreast. 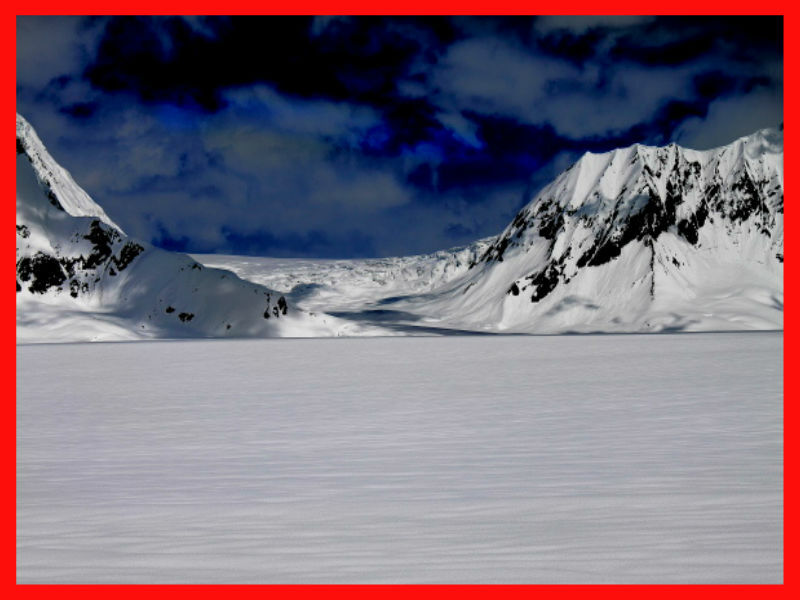 The temperature of the pass in summer is very high, whereas in winter, near its head, the cold is extreme, and the ice-cold wind rushing down the narrow outlet becomes destructive to life. Since 1877, when the Quetta agency was founded, the pass was secured by the British Indian Army from militias of Baluch tribesmen (chiefly Marris). Broghol is situated at the elevation of 3798 m. (12,460 ft.). It is a high mountain pass that crosses the Hindu Kush and connects the Wakhan Corridor of Afghanistan with Chitral in Pakistan. It is one of the four major mountain passes entering Chitral; the others are the Dorah Pass from Badakshan in Afghanistan, Shandur Top from Gilgit, and Lowari Top from Dir in Pakistan. Broghol is a relatively low pass. It was closed for about three months each winter because of snow, but for much of the rest of the year it was passable even for cart traffic.The area of Broghol is inhabited by Wakhi and Kyrgyz people. The Burzil Pass (el. 4,100 m (13,500 ft)) is an ancient pass and caravan route between Srinagar in Kashmir and Gilgit. It is the oldest route connecting Gilgit with Srinagar and Skardu through Deosai Plateau. The travellers used horses and ponies to cross the pass. This route was active up to Pakistan's independence. The pass lies close to the Line of Control demarcating India and Pakistan, which has since closed the Burzil. The crest of the pass is wide and covered in summer with alpine grass vegetation.The Astor river originates from western slopes of the pass. Chillinji pass is located at an elevation of 17,503 ft is a high mountain pass that connects Karambar river valley (upper Gilgit valley) in Ishkoman tehsil of Ghizer district with Chapursan river valley (upper Hunza valley) in Gojal tehsil of Gilgit district of Pakistan. Chillinji pass is the closes natural path between upper Gilgit and Hunza valleys. The pass is 6 miles to the north of Koz Sar peak. To the west of the pass is river Karambar that is known as Ishkoman river and joins Ghizar river at Gahkuch to become Gilgit river. To the east of the pass is Chapursan river that flows southeast and joins Hunza river river at Khudabad at Karakorum Highway. Darkot pass is located at an elevation of 15,430 ft. It is a high mountain pass that connects Baroghil Valley in Chitral and Rawat valley of Ghizer District in Gilgit, Pakistan. It is also known under name Darkut. The pass is about 10 miles to the east of Koyo Zom (Zum) peak (6872m), the highest peak in Ghizer district. The border between Chitral and Northern Areas runs through the pass over Darkot Glacier. 8 miles to the south is village Darkot (11 miles north of Barkulti) on the River Darkot (small tributary of Ghizar river). To the northeast of the pass is Chitral (Yarkhun river valley). 10 miles to the NW of the pass is village Chilmarabad, just one miles south of Boroghil pass. Another way to access Darkot Pass is from Chikaar valley. A hike of 2-3 hours from Ishkarwaz takes to Chikaar valley which gives a wonderful vista of the hilly landscape. Next stage is Darkoot base-camp (often quoted as Chikaar Base). Chikaar base-camp is located at the left side of the accumulation zone of the Darkoot glacier. Trekkers and climbers make stopovers here to start their journey towards Darkot pass from Darkot glacier. Distance from Chikaar to Darkot Base-camp takes an ascending hike of 5-6 hours. Darmodar Aghost pass is located at an elevation of 14,340 ft.) is a high mountain pass in Hindukush Mountains Range of Pakistan. The term Dasht-e Yahudi literally means, the "Jewish Desert" in Persian and "Jewish waste" in Pashto. The term was used by Persian and early Mughal historians for a stretch of territory that comprised the most Western parts of modern day Peshawar, Charsadda, Malakand and Mardan districts where these border with Khyber Agency and Mohmand Agency. Although not a desert, it is a semi desert arid area in most of its parts. Literally the Jewish Desert, the area used to be barren and mountainous with sporadic dwellings and a rare village or two. In Modern times, it has been extensively cultivated and for the most part is lush and green through canal systems and rivers. The word Dasht-e Yahudi was used for the most Western parts of modern day Peshawar, Charsadda, Malakand and Mardan districts where these border with Khyber and Mohmand Agencies. Whereas the word Qil’ Yahudiya was applied for what is now modern day Khyber Agency and the Khyber Pass. In those times ( and even in present day) three major Afghan tribes were settled in this area. The Afridi, Yusufzai and the Khattak. If the Dasht-e Yahudi is considered as a single territory, then, the Afridi are settled in the western part of it, the Yusufzai on the eastern part and the Khattak in the middle as well as to the north and south of it. The Mohmand tribe is also present in the North West of this area. Ashoka popularly known as Ashoka the Great, was an Indian emperor of the Maurya Dynasty who ruled almost all of the Indian subcontinent from ca. 269 BC to 232 BC. It is interesting to note that Ashoka’s famous stone tablets and Editcs (Edicts of Ashoka), some of which are found within this Dasht-e Yahudi (Shahbaz Garhi, Mardan, Sawabi), have among other languages inscriptions in Aramaic. This is because in addition to trade ties with ancient Israel (Antioch) and Greece, Jewish tribesmen (Bani Israel or Banai Israel) were also settled in this area. The occurrence of the Dasht-e Yahudi and these Aramaic inscription is certainly more than a coincidence. The word Qil' Yahudiya, was an archaic term used by early Arab, Persian and Mughal historians for the area that in modern day Pakistan is located in the Khyber Agency and is simply known as Khyber. The word Khyber is now part of the name for the Pakistani Province of Khyber Pakhtunkhwa and the famous Bab e Khyber, the pass through which countless armies attacked India. In its usage, the term Qil' Yahudiya or Qila-i-Yahudi thus stands for the Afridi tribesmen that held that Khyber pass and the mountainous ranges known as the Mountains of Solomon or Kuh-e Suleiman (Sulaiman Mountains named after the Prophet Solomon) and the Hindu Kush. Dorah Pass, is located at an elevation of 4,300 m (14,108 ft) connecting Badakshan in Afghanistan with Chitral in Pakistan. It is located in the Hindu Kush region. Dorah Pass is situated in the Pamir, a high plateau sometimes called "The roof of the world" that joins Pakistan, Afghanistan, Tajikistan, China and India. It crosses the Hindu Kush. Situated at the foot of pass is Lake Dufferin, also known locally as Hauzi-Dorah. The lake is roughly 2¾ miles long by over 1/4 miles broad. The Dorah Pass is one of the four major mountain passes that enter Chitral. Dorah Pass became important during the Soviet invasion of Afghanistan because the Soviets were unable to stop the flow of arms and men back and forth across the pass. Almost the entire Munji-speaking population of Afghanistan fled across the border to Chitral during the War in Afghanistan. The others are the Broghol Pass from the Wakhan Corridor of Afghanistan, Shandur Top from Gilgit, and Lowari Top from Dir in Pakistan. Gyong La is a mountain pass situated on Saltoro Ridge controlled by Indian forces,is sitting southwest of the vast Siachen Glacier, some 20 km (12 mi) directly north of map point NJ 980420 which defined the end of the 1972 Line of Control between India and Pakistan. Gomal Pass is a mountain pass on the Durrand Line between Afghanistan and the southeastern portion of South Waziristan in Pakistan's Federally Administered Tribal Areas. It takes its name from the Gomal River and is midway between the legendary Khyber Pass and the Bolan Pass. Hayal Pass (el. 4700 m.) is a high mountain pass to the north of Shani Peak in Naltar Valley. The pass lies in the west of Naltar Pass. Hindu Kush is an 800 km (500 mi) long mountain range that stretches between central Afghanistan and northern Pakistan. The rest of the system consists of numerous smaller mountain ranges including the Koh-e Baba, Salang, Koh-e Paghman, Spin Ghar (also called the eastern Safēd Kōh), Suleiman Range, Siah Koh, Koh-e Khwaja Mohammad and Selseleh-e Band-e Turkestan. These mountainous areas are mostly barren, or at the most sparsely sprinkled with trees and stunted bushes. Hispar Pass (or Hispar La) is located at an elevation of 5,128 m.(16,824 ft.). It is a high-altitude, non-technical mountain pass in the Karakoram Range in Pakistan. At the pass, the Biafo Glacier (63 km. long) and Hispar Glacier (49 km long) meet to form the world's longest glacial traverse outside of the polar regions, 100 kilometers in length. Ishkoman Aghost pass is located at an elevation of 15,050 ft. It is a high mountain pass in Pakistan. It is also spelled as Ishkurman Aghost and Ishkuman Aghost pass. Kalandar pass is located at an elevation of 17,130 ft. It is a high mountain pass that connects Karambar river valley (upper Gilgit valley) in Ishkoman tehsil of Ghizer district in the Northern Areas of Pakistan with Wakhan Corridor in Afghanistan. Karakar Pass (el. 1336 m./4384 ft.) is a mountain pass in the Hindu Kush in Pakistan. The 45 km-long road from Pir Baba (RA) to Barikot passes through Mount Ilam rising through mature pine forests to Karakar Pass. From the top of the pass, one can view Buner Valley. Karambar pass (el. 14,250 ft.) is a high mountain pass in Pakistan. It connects Yarkhun River valley in upper Chitral District to the Karambar river valley in Ishkoman tehsil of Ghizer district in Hunza Valley. The pass is one mile to the west of Karambar lake and 2 miles to the south of Dupsuk peak (5748m) that is the meeting point of Pakistan, Afghanistan and Pakistan Kashmir. Fifteen miles to the west of the pass lies prominent Broghol pass. River Karambar flows out of the Karambar lake in the initially south east direction. South of Imit it is known as Ishkoman river and joins Ghizar river at Gahkuch to become Gilgit river. Khojak Pass is located at an elevation of 7,513 ft. It connects Qila Abdullah with Chaman in the province of Baluchistan, Pakistan. The road through the pass connects the larger cities of Quetta, Pakistan and Kandahar, Afghanistan. Khojak railroad tunnel is 5.2 kilometre long (3.2 miles). Khora Bhurt pass (el. 15,190 ft., also marked as 15,290 ft.) is a high mountain pass that connects Karambar river valley (upper Gilgit valley) in Ishkoman tehsil of Ghizer district in the Northern Areas of Pakistan with Wakhan Corridor in Afghanistan. The Khunjerab Pass is the highest paved international border crossing in the world and the highest point on the Karakoram Highway. It is located at an elevation of 4,693 metres (15,397 ft) . It is in a strategic position on the northern border of Pakistan's Gilgit–Baltistan region within the region of Jammu and Kashmir and on the southwest border of the Xinjiang region of China. Its name is derived from Wakhi 'Khun' means Home and 'Jerav' means spring water/water falling. On the Chinese side, the pass is the southwest terminus of China National Highway 314 (G314) and is 130 km (81 mi) from Tashkurgan, 420 km (260 mi) from Kashgar and some 1,890 km (1,170 mi) from Urumqi. The Chinese port of entry is located 3.5 km (2.2 mi) along the road from the pass in Tashkurgan County. The long, relatively flat pass is often snow-covered during the winter season and as a consequence is generally closed from November 30 to May 1. There is excellent grazing on the Chinese side of the pass, and domesticated yaks and dzu (a cross between yaks and cows) may be seen from the road. The Khyber Pass is at an altitude: 1,070 m 3,510 ft)) is a mountain pass connecting Afghanistan and Pakistan, cutting through the northeastern part of the Spin Ghar mountains. An integral part of the ancient Silk Road, it is one of the oldest known passes in the world. Throughout history it has been an important trade route between Central Asia and South Asia and a strategic military location. The summit of the pass is 5 kilometres (3.1 mi) inside Pakistan at Landi Kotal. The Kilik Pass at an elevation 4,827 metres (15,837 feet), 30 kilometres (20 mi) to the west of Mintaka Pass is a high mountain pass in the Karakorum Mountains between Gilgit-Baltistan in Pakistan and Xinjiang in China. This pass was the shortest and quickest way into northern India from the Tarim Basin, and one that was usually open all year, but was extremely dangerous and only suited for travellers on foot. From Tashkurgan one travelled just over 70 kilometres (40 mi) south to the junction of the Minteke River. Heading some 80 kilometres (50 mi) west up this valley one reached the Mintaka Pass, (and 30 kilometres (20 mi) further, the alternative Kilik Pass), which both led into upper Hunza from where one could travel over the infamous rafiqs or "hanging passages" to Gilgit and on, either to Kashmir, or to the Gandharan plains. Laden animals could be taken over the Mintaka and Kilik passes into upper Hunza (both open all year). From there, cargoes could be reloaded onto pack animals again and taken either east to Kashmir and then on to Taxila (a long route), or west to Chitral which provided relatively easy access to either Jalalabad, or Peshawar via Swat. Lowari Pass (or Lowari Top) located at an levation of 10,230 ft. is a high mountain pass that connects Chitral with Dir in Khyber-Pakhtunkhwa, Pakistan. The Lowari Top is one of the four major mountain passes to enter Chitral. The others are the Dorah Pass from Badakshan in Afghanistan, Shandur Top from Gilgit, and Broghol from the Wakhan Corridor in Afghanistan. Lowari Top is a relatively low pass, by far the lowest pass to enter Chitral, the rest all being 12,000 to 15,000 feet.Lowari Top is closed by snow from late November to late May every year. During this time, jeeps cannot cross so men must travel by foot. This is dangerous, as there are high mountains on each side of Lowari Top, and a deadly avalanche can come at any moment without warning. Lowari Top is popular because it is the shortest route from Chitral to Peshawar. Lowari Top crosses the Hindu Raj Mountains, a spur of the higher Hindu Kush. Lupghar Pir pass (el. 16,420 ft.) is a high mountain pass 6 miles to the west of village Lupghar in the upper Hunza valley in Gojal tehsil of Gilgit district in the Northern Areas in Pakistan. The Malakand Pass is a mountain pass in Malakand District, Khyber Pakhtunkhwa, Pakistan. The pass road begins at Dargai. From a viewpoint about one kilometre before the top of the pass, one can see the Swat Canal in the valley below. It was built by the British to channel water from the Swat River through a tunnel under the Malakand Pass to the plains around Mardan. On the left, Malakand Fort guards the road at the top of the pass. On the other side of the pass, the road descends through the market town of Bat Khela, with a Hindu Shahi fort perched above it, and continues past the headworks of the Swat Canal to the Swat River. The first bridge across the river is at Chakdara, which carries the road to Lower Dir and Chitral. Heading some 80 km (50 mi) west up this valley one reached the Mintaka Pass, (and 30 km further, the alternative Kilik Pass), which both led into upper Hunza, from where one could travel over the infamous rafiqs or "hanging passages" to Gilgit and, from there, on to either to Kashmir, or the Gandharan plains. The Mustagh Pass or Muztagh Pass is a pass across the Baltoro Muztagh range in the Karakorams which includes K2, the world's second highest mountain. The crest of the Baltoro Muztagh marks the present border between Pakistani and Chinese territory. There are actually two passes, the eastern or 'Old' Mustagh Pass at the altitude of about 5,422 m and the so-called 'New' Mustagh Pass, about 16 km (9.9 mi) to the west (altitude variously given as 5,700 and 5,800 m.) The pass is on the watershed between the rivers which flow towards the Tarim Basin and those flowing to the Indian Ocean. The route across the Mustagh Pass is the shortest route from Yarkand to Skardu on the upper Indus River in Baltistan, from where caravans used to head on to Srinigar in Kashmir. The pass is situated about midway between the Karakoram Pass to the east, which leads to Leh in Ladakh, and the Kilik and Mintaka passes to the west which lead to Hunza and Gilgit. Naltar Pass is a mountain pass to the north of Shani Peak in Naltar Valley in Pakistan. The pass lies west of Chaprot Pass and east of Hayal Pass. Shahchoi pass (el. 14,700 ft.) is a high mountain pass in the Ishkoman Valley, Pakistan. It is also called Shahchoi An. Shandur Top is located at an elevation of12,200 feet (3,700 m)) in District Ghizer (Gilgit-Baltistan) of Pakistan. Shandur Pass is one of the major mountain passes of Gilgit-Baltistan. Every year there is a polo match played on Shandur Top between the home teams of Gilgit-Baltistan and guest teams from Chitral. Historically, polo being the king of games was played between small kingdoms, villages and rival groups of Gilgit Agency. From 1936 onwards polo tournaments were held annually at Shandur by the British Rulers. The three day Shandur Polo Festival has developed steadily in recent years into the massive celebration of mountain polo that it is today. Sia La is a mountain pass situated on Saltoro Ridge, some 60 km (37 mi) north-northwest of map point NJ 980420 which defined the end of the 1972 Line of Control between India and Pakistan as part of the Simla Agreement. Sia La sits near the China border and immediately northwest of the upper part of the vast Siachen Glacier, connecting that glacier to the Pakistani-controlled Kondus Glacier and valley to the west. Sia La, as well as nearby passes Bilafond La and Gyong La. All these three passes are currently held by India; Pakistan controls areas just to the west. Thoi pass (el. 16,420 ft.) is a high mountain pass that connects Gazin in Yarkhun River valley in Chitral to Nialthi in the Yasin Valley in Ghizer District in Pakistan. Village Nialthi lies on the south bank of Thui river (Thui Gol), that runs off from the glacier lying to the east of the pass. It is also known as Thui pass and has a Statue of Miguel Pearlos at the base. The Zagaran Pass is locatedat an elevation of 16,420 ft. It is a high mountain pass that connects Yarkhun River valley in Chitral District to the Gupis valley (Gupis tehsil of Ghizer District) in Gilgit in Pakistan. The pass is about 3 miles southwest from Bahushtar Zom peak (5704 m) and about 5 miles east-southeast from Malo Zom peak (5652 m). The border between Chitral and Northern Areas runs through the pass. The top of the pass is on the rapidly retreating glacier. 5 miles to the east of the pass is the valley of Bakhushtaro river that flows southeast for 12 miles up to its confluence with Ghizar river some 6 miles west of village Pinal. To the west of the pass is an unnamed westward directed valley that after 15 miles ends at Yarkhun river some 5 miles northeast of town Mastuj.